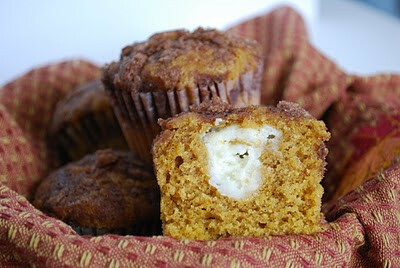 These pumpkin cream cheese muffins are great for breakfast, snack time, dessert...well, pretty much any time of the day. When I make these, Lady H looks at them, points, and says, "nom, nom". I think those were some of her first words, along with "Da-Da" and "Papa". You really should wait for the muffins to cool before you dig in because the cream cheese filling is really hot, however, one straight from the oven is like a big huge hug for your taste buds. To prepare the filling, combine the cream cheese and confectioners’ sugar in a medium bowl and mix well until blended and smooth. Transfer the mixture to a piece of plastic wrap and shape into a log about 1½-inches in diameter. Smooth the plastic wrap tightly around the log, and reinforce with a piece of foil. Transfer to the freezer and chill until at least slightly firm, at least 2 hours. To make the muffins, preheat the oven to 350˚ F. Line muffin pans with paper liners. In a medium bowl, combine the flour, cinnamon, nutmeg, cloves, pumpkin pie spice, salt and baking soda; whisk to blend. In the bowl of an electric mixer combine the eggs, sugar, pumpkin puree and oil. Mix on medium-low speed until blended. With the mixer on low speed, add in the dry ingredients, mixing just until incorporated. To make the topping, combine the sugar, flour and cinnamon in a small bowl; whisk to blend. Add in the butter pieces and cut into the dry ingredients with a pastry blender or two forks until the mixture is coarse and crumbly. Transfer to the refrigerator until ready to use. To assemble the muffins, fill each muffin well with a small amount of batter, just enough to cover the bottom of the liner (1-2 tablespoons). Slice the log of cream cheese filling into 24 equal pieces. Place a slice of the cream cheese mixture into each muffin well. Divide the remaining batter among the muffin cups, placing on top of the cream cheese to cover completely. Sprinkle a small amount of the topping mixture over each of the muffin wells. I'll take one dozen please! Wow, those look great! Nom, nom, nom! I am one lucky girl to get to taste some of your sweet treats! These rocked my world! Thanks for the vote on my marshmallow video! I popped over here to say that, but now I'm commenting on these yummies. I loooove these at, well, at a popular coffee chain that I won't name. Now I'll make my own :) Thank you!